Why buy certified seed? Check out this video. It starts with the seed. Every bag of certified seed you plant is an investment in you, the Canadian farmer. That’s because when you choose certified seed, you’re not just getting a proven, quality product – you’re putting money back into the research and development of new and advanced seed varieties. This brings value to your farm, gives you more choices, generates jobs in agriculture and stimulates the Canadian economy. With yields in canola increasing 27% and corn increasing almost 60% over the last 15 years, the proof is in your fields. And although we’re in a position to be a leader in seed driven innovation, Canada falls near the bottom of the list globally when it comes to generating funds for reinvestment in cereals and other crop types. Without fostering investment, productivity suffers. 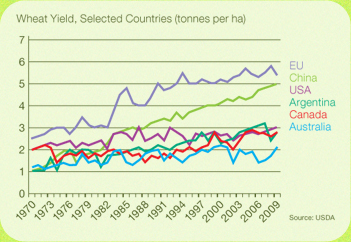 It is clear to see just how far we fall behind when we compare our wheat yields to those of competing countries. So what can you do to help take Canadian agriculture to the next level? It’s simple, really. Continue planting and protecting certified seed. Your investment in certified seed translates to investment in seed R&D. Canadian seed companies traditionally invest 26% of their combined operating budgets in plant breeding and research to develop better varieties. You’ll have access to new varieties that have been bred for success – your success, on a local and a global scale.